Motorcycle owners are being warned about a spate of thefts of motorbikes and moped across Brighton and Hove. From 17 August to 17 September there have been been 30 reported thefts or attempt thefts of motorcycles across the city. This is effectively one incident per day. Many of these motorcycles have been recovered in other parts of the city and beyond, with ignition wires having been tampered with to start the vehicle. A number of arrests have been made as a result of forensics and with suspects being identified through other enquiries. Inspector Paul Ransome said: “The common theme for these thefts is unsurprising – the thieves operate throughout the hours of darkness and take the bikes from motorcycle bays and the roadside in general. “The spread of offences is throughout the city and types range from high powered bikes to scooters and mopeds. Consider buying private CCTV to cover your private parking area. You can also consider purchasing a tracker, chains tied to immoveable objects, bike locks, disabling the motorcycle to avoid it being started, fitting a bike alarm/immobiliser and should report any suspicious activity to the police. Insp Ransome said: “The rise in motorcycle thefts is alarming and we are considering potential tactics to deter and catch the criminals responsible, but we need the public to play their part. 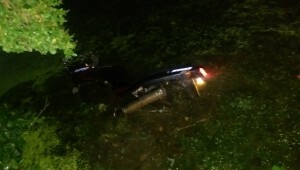 The bike in the picture was dumped in Queen’s Park pond in the early hours of August 21, and the picture posted by the landlord of the Constant Service on Facebook, which in turn led to a press query from this site, and the bike being reunited with its owner. A Sussex Police spokesman said: When I was looking up your enquiry, I spotted a motorbike reported stolen from near the pond.